Oh, look, it's snowing again. For the bazzilionth time this winter. Shocking, I know. I'm trying hard to be positive and see the bright side. I'm cozy and dry at home. I have food in the fridge and a blissfully well stocked liquor cabinet. I have a sweet furry dog to keep me extra warm. But the house-bound, stir-crazy thing is making it hard to see the glass as half full. So I'm going to fill it with a little spring. It's ironic that so much beautiful citrus is available in the middle of this snowy mess but it would be a shame not to take advantage of it. Beautiful blood oranges were piled high on a display in my market and the smell of fresh mint hit me when I walked past the herbs. So what if it's atrocious outside. It's warm and citrusy and minty inside. Cheers! 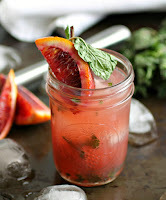 Combine the gin, blood orange juice, lime juice, simple syrup, elderflower liqueur and fresh mint in a cocktail shaker. Muddle the mint using a muddler or a wooden spoon. Fill with ice, shake well and strain into a cocktail glass. 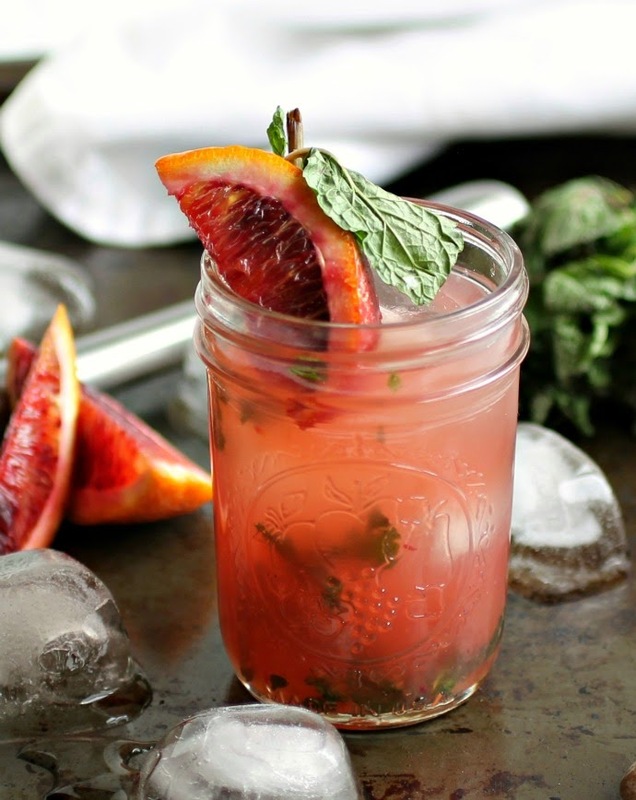 Garnish with extra mint and a wedge of blood orange, if desired. There's so much to love about this cocktail. Blood orange is favorite of all the winter citrus. Love the melting ice cubes in your photos. Pinned. Awesome cocktail Anita - cheers! Followed you over here from a cocktail life! This post hit my Inbox at the perfect time-happy hour! For whatever divine reason, I had all the ingredients on hand so just made the drink. I'm enjoying it as we speak. The blood orange imparts such a wonderful flavor and color. Thanks for the recipe- cheers!! This sounds and looks amazing! Love the stunning reddish orange color! Very refreshing cocktail!